In the pages that follow, I begin by identifying potentially competing goals. Newsrooms can strive for democratic or business goals. Academics can be practical, administrative researchers or critical scholars. Although there is a utility to thinking about these sorts of tradeoffs, it also is limiting. To navigate our way around or through these tense waters, I use an approach from pragmatism, the philosophical tradition with which Dewey’s work is associated—namely, scrutinizing dichotomies for their utility. Dewey, like most of the naturalistically inclined pragmatists, saw our world as a series of shaded continuums, and not as holding many either/or dichotomies. Most of the dichotomies we take as central are of our own making; many of these cause more problems as conceptual tools than they solve (S. Stroud 2011). When considering both the role of journalism and the role of academics, it is useful to think about continuums. Although there are tensions between democratic and business goals, and between critical scholarship and administrative research, there are also instances in which these goals are not in conflict. Reframing the debate by dissolving these limiting dichotomies is the purpose of this chapter. The most worrisome quadrant of the grid is newsrooms facing both harmful business and democratic outcomes. Much research suggests that when the news media industry faces tougher economic times, democracy suffers. Newsroom business models are showing signs of weakness as audiences increasingly move to digital forms of news. Traditional means of earning revenue no longer yield the same return they did even a decade ago. Advertising dollars, the main driver of news revenue, have declined. Print advertising revenue totaled $44.9 million in 2003. In 2012, revenues were $18.9 million (Pew Research Center 2014a). Newer forms of revenue have not made up for the losses. Online ad revenue has grown from $1.2 million in 2003 to just $3.4 million. Although local television news has fared somewhat better than newspapers, Pew Research (2014a) reports that between 2006 and 2011, their revenues dropped by more than 30 percent. Turmoil on the news business side has democratic implications. Democratic effects can be seen among citizens and in elections. Among citizens, civic engagement and voter turnout are affected by the vibrancy of the local media market. When local media cover U.S. House members less frequently, citizens know less about politics and are less politically engaged (Hayes and Lawless 2015; Snyder and Strömberg 2010). …When local newspapers close, evidence suggests that civic engagement and voter turnout decline (Schulhofer-Wohl and Garrido 2013; Shaker 2014). …When the media aren’t minding the statehouse, citizens aren’t either. A less-than-robust media also portends bad news for elections and political officials. House members are less active on behalf of their districts when they face less media coverage at home (Snyder and Strömberg 2010). … In addition to affecting the behavior of elected officials, media coverage also influences elections. Schulhofer-Wohl and Garrido (2013) examine the electoral consequences of the Cincinnati Post‘s closure, concluding that “its absence appears to have made local elections less competitive along several dimensions: incumbent advantage, voter turnout, campaign spending, and the number of candidates for office” (78). As these studies show, elections are conducted and public officials act in less democratic ways in the absence of an attentive local media. Research pertinent to this first quadrant demonstrates the connection between the health of the news industry and the health of democracy. Communities with a vibrant news media are more likely to have politically engaged citizens, competitive elections, and responsive elected officials. Flagging revenues for the news media mean more than a natural market correction, they have implications for the functioning of democracy. The two off-diagonal quadrants signal the trade-offs that newsrooms can face and represent the classic tension between democratic and business goals. On the one hand, a focus on business outcomes can lead a newsroom to shirk its democratic role, emphasizing entertainment content over hard news. On the other hand, a focus on hard news coverage could fail to find an audience that allows a news organization to stay in business. 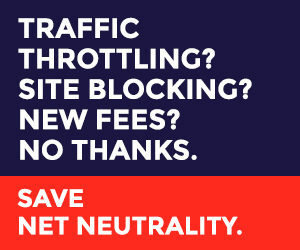 Evidence of these trade-offs is plentiful. As a business, news organizations must pay careful attention to metrics that translate into revenues. For many news organizations, page views and unique visitors translate into digital advertising revenue. …The availability of these metrics can change how news organizations do their work. Vu (2014) conducted a survey of newspaper editors to learn about their use of digital metrics. Over 80 percent of editors whose jobs involved the online production of news said that they regularly attended to traffic metrics. Although not a strong relationship, editors recognized the payoff that comes from monitoring traffic: “The more editors feel that getting high readership brings economic benefits to the organizations, the more likely they are to make editorial changes based on online audience web analytics” (Vu, 1104). In this way, online traffic figures become a new gatekeeper, affecting what appears as news. If news organizations follow audience desires, what sort of content would news organizations wanting to increase page views offer? And what are the democratic effects of content that caters to audience desires? Audience behavior with respect to election coverage, partisan and uncivil news content, and entertainment programming, shows exactly what is suggested by the off-diagonal quadrants: a clear contrast between the content that increases page views and the content that moves us closer to democratic ideals. Campaign season represents a period when the media devote extensive attention to politics, but not all campaign coverage attracts equal public attention. In an early demonstration, Iyengar, Norpoth, and Hahn (2004) tracked where people went when they were asked to browse a CD containing information about the 2000 presidential campaign. The CD contained information on a host of topics, such as the candidates’ background and issue stances. Audiences seemed drawn toward horserace coverage that described which candidate led in the polls and the candidates’ strategies for electoral success. To the extent that the result replicates today, news organizations carefully monitoring digital traffic could conclude that they should boost horserace coverage during campaigns. The effects of this form of coverage, however, are potentially troubling. Cappella and Jamieson (1996) found that horserace coverage increased political cynicism, an outcome that seems to move us away from Dewey’s notion of a great community. A focus on page views leaves this democratic consequence unmonitored; it may even risk increasing the use of publicity-gathering horserace coverage that hurts the democratic ideals we hope to instantiate through the institution of journalism. Partisan and uncivil content also make more business than democratic sense. In interviews with news staff, several reported that partisan and polarizing news content can be good for an organization’s bottom line (Scacco, Curry, and Stroud 2015). Inflammatory articles, news featuring polarizing political figures, and comment sections that generate fights among those with competing partisan viewpoints can dramatically increase page views, return visits, and time on site. In a tightly controlled experiment comparing civil and uncivil media coverage, participants in a study by Mutz and Reeves (2005) reported enjoying the uncivil version more. From a business perspective, uncivil and polarizing content is a good idea. From a democratic perspective, however, the case is not so clear. Likeminded partisan content can increase political polarization, whereby citizens increasingly favor their own political perspective over the opposition (Levendusky 2013; Stroud 2011). Uncivil comments left in comment sections also can polarize attitudes (Anderson et al. 2014) and negatively affect what people think about a news source (Lee 2012). In their research, Mutz and Reeves demonstrated that uncivil news content reduced trust in politicians and Congress relative to civil versions of the same content. Digital metrics showing a spike in page views for partisan and uncivil content, however, gives newsrooms a financial incentive to produce and promote this content. Soft news and entertainment also attract audiences. Survey research, once a dominant way to understand readers’ news interests, finds that the public has a strong interest in public affairs. Behavioral data from tracking where people go online, however, shows far less engagement with public affairs news content (Tewksbury 2003). The widespread availability of digital analytics within newsrooms only highlights this fact for newsrooms. Boczkowski and Mitchelstein (2013) compared the type of news most often read by site visitors to the type of news most often prioritized by editorial staff. Visitors looked to soft news, such as human interest stories, more than editors prioritized this content. There are democratic consequences when citizens abandon news in favor of more entertaining fare. When those with a preference for entertainment over public affairs news content have the ability to act on those preferences (such as when they have the breadth of content provided by the Internet), they do so. Those eschewing news have lower levels of political knowledge and turn out to vote less frequently when they are able to choose more entertaining content (Prior 2007). If preferences for human interest stories outweigh the desire for hard news, metrics-based newsrooms will provide more of the former and, if the overall availability of hard news content declines, even those with a preference for it may not be able to find it. These potential democratic consequences accrue most clearly if many news organizations adopt a follow-the-page-view approach to news. To be fair, this is unlikely to occur on a mass scale. Segmentation will guarantee that some news organizations will offer in-depth, issues-based political reporting, whether because they have a civic commitment to it or because they can generate a financial return from offering the content. But in pressing economic times, news organizations are forced to figure out how to increase, or maintain, revenues. To the extent that the audience preferences documented here hold, unbiased political news has a much smaller chance of returning large traffic numbers compared to horserace, partisan, and entertaining content. By focusing on page views, there is evidence that the democratic impact of journalism would suffer. By ignoring page views, journalism may fail to make a profit. These disappointing trade-offs are valid and important—but focusing too much on the trade-offs ignores the opportunity made possible by the final quadrant to which I now turn. 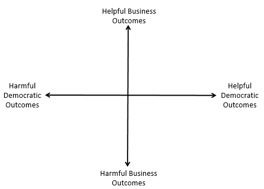 Although the three quadrants reviewed thus far all point to undesirable consequences, the utility of drawing from the pragmatist approach is the recognition that there are some moments in which business and democratic goals do not conflict. 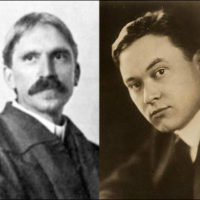 Lippmann and Dewey famously disagreed in their prescription for solving the problems they saw facing democracy. Although Lippmann saw a limited role for the press, Dewey was far more optimistic about the media. In Dewey’s (1922/1983) glowing review of Lippmann’s 1922 book, Public Opinion, (“To read the book is an experience in illumination,” wrote Dewey, 337), Dewey modestly offers a “suggestion” (343). “Mr. 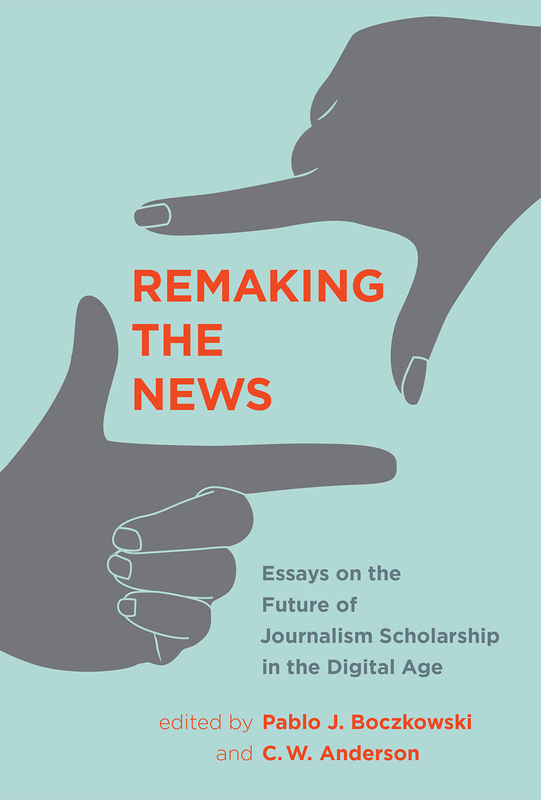 Lippmann seems to surrender the case for the press too readily,” Dewey writes, “To assume too easily that what the press is it must continue to be” (343). Instead, Dewey suggests, the news should be in the business of finding artful ways to present the news. He continues, “If the word ‘sensational’ can be used in a good sense, it may be said that a competent treatment of the news of the day, one based upon continuing research and organization, would be more sensational than present methods afford” (343). Figuring out how to make sensational news represents a promising opportunity to blend the business and democratic interests of news organizations.